Sponsored by the Buddhist Association of China, undertaken by the Buddhist Association of Jiangsu Province and the Buddhist Association of Nanjing, Enshrining Ceremony for Usnisa was held in Nanjing Niushou Mountain, together with the opening ceremony of Nanjing Niushou Mountain Cultural Tourism Zone. Master Xuecheng, president of the Buddhist Association of China; Master Hsing Yun, president of the Buddha's Light International Association; Hu Chuang Meng Baron, vice president of the Buddhist Association of China; Panchen Lama Qoig Gio Jeb, vice president of the Buddhist Association of China; Jiang Jianyong, vice director of State Administration for Religious Affairs of P.R.C; Wu Wenxue, vice director of China National Tourism Administration; Xu Jinrong, vice-governor of Jiangsu Province; Wang Xuefei, vice chairman of Jiangsu Provincial CPPCC and minister of Jiangsu Provincial United Front Work Department; Miao Ruilin, mayor of Nanjing; Chen Shaoze, director of the Standing Committee of Nanjing Congress; Shen Jian, chairman of Nanjing Municipal CPPCC; and over 1,000 Buddhists attended the Enshrining Ceremony. At 9 AM., the welcoming group escorted Usnisa from Qixia Mountain to Niushou Mountain. Then, the enshrining ceremony was held sequentially in Great Buddha’s Hall of Usnisa Temple and Thousand-Buddha Hall of Usnisa Palace. 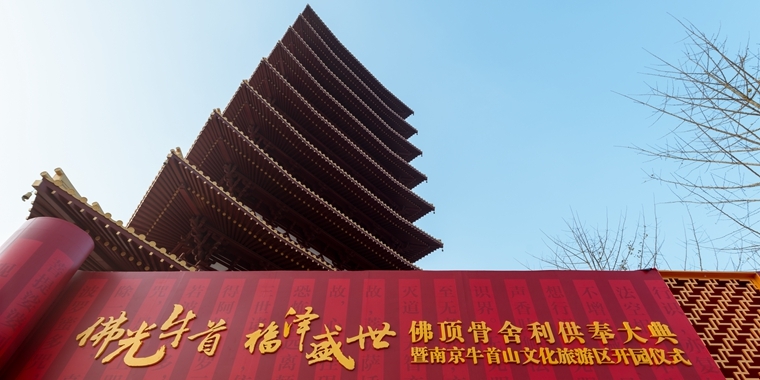 After this, Enshrining Ceremony for Usnisa and Opening Ceremony of Nanjing Niushou Mountain Cultural Tourism Zone was held in south square of Usnisa Palace. Master Xue Cheng, Master Hsing Yun, Master Long Xiang, Miao Ruilin, Xu Jinrong and Jiang Jianyong made speeches respectively. Master Xue Cheng expressed appreciation to the significant work of Jiangsu Provincial and Nanjing municipal government, and spoke highly of the “Buddha Worshipping Month in Nanjing” which has been held for 5 years continuously. Meanwhile, he hoped that Usnisa Temple can be a tranquil and solemn preaching site. With common efforts, Usnisa can be enshrined and protected well, thus coming up to the expectation of the public. Miao Ruilin, the mayor, claimed that culture relics protection and cultural innovation should be combined with actual situation of Nanjing so as to realize the development and prosperity of Nanjing culture. The long-term enshrining of Usnisa in Niushou Mountain and opening of Nanjing Niushou Mountain Cultural Tourism Zone became a new milestone in historical inheritance and humanistic development. We will take this opportunity to inherit and develop the historical and cultural resources. Hope that our seniors, great masters and friends can support the development of Nanjing. Let’s work together to build prosperous and peaceful Nanjing. 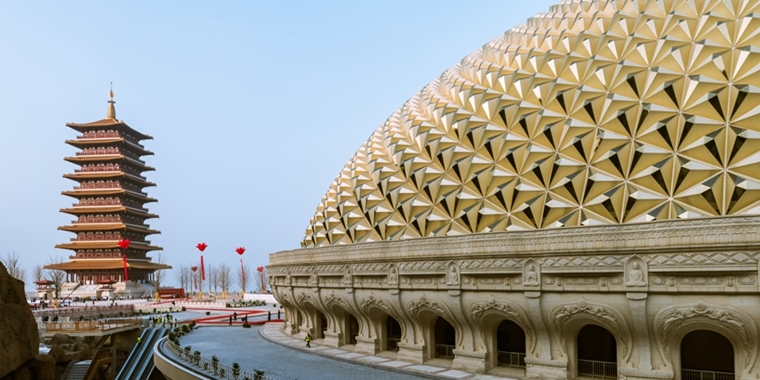 As the holy relic in Buddhism, Usnisa has attracted over 100,000 Buddhism followers to worship, since its reappearance to the public in Nanjing in 2010. With profound Buddhism culture, Nanjing has been an important Buddhist city in history, and Niushou Mountain became origin of Niutou Chan sect. The Usnisa Temple, Usnisa Palace and Usnisa Pagoda are constructed as the long-term enshrining place, which will make Niushou Mountain a holy place for Buddhism followers and a platform for Buddhism communication at home and abroad.